It doesn’t matter what age they are, the minute you load up your car to go across country for a road trip vacation, kids turn into little monsters. We do say this because, there are many factors that come into play. They aren’t used to the log drive, they are uncomfortable with the lack of regular facilities at their disposal. To top it all, they are just not interested in playing the traditional games which we have grown up playing in our childhood. So, when nothing seems to work, technology becomes one’s best friend. Load up your iPad Mentioned below are the best road trip game apps for toddlers, kids and pre-teens. Starting with the babies, those young travelers, who are probably experiencing their first road trip ever. Mentioned below are the game apps that have bright colors and are simple and easy to play. Flow Free: This game is perfect for the tiny tots that have just learnt about colors. With a simple interface, they can pair the colors. The screen fills up with multitudes of colorful pipes because of it. There are many levels available in this game and can be enjoyed by the whole family. Once downloaded, this game does not need any WIFI or internet for use. Perfect for those long car rides. Sago Mini World: This app has a whole variety of characters that hold your child’s attention all through your journey. With them they go through different adventures like drive a firetruck or becoming a superhero. This application has no third-party ads and can played without the need of WIFI or internet. Duckie Deck Giggle Glass: Snapshot galore! With this application, the kids can use many filters and have silly snapshots of themselves or the location around them. They can also use it as a magnifying glass and make funny faces or see the world around them a little differently. Priced at US $ 2.99, this is a must download app before beginning one’s journey! Kids in this age bracket believe that they know everything. For them, we offer games with which they can experiment and learn about many different things. This Is My Car — Mechanics For Kids: What an amazing app. It allows the kids to build their own dream car. What’s more, they can change tires, refuel the car and even washing the car. It helps satisfy their curiosity about how cars work and learn how the many different parts of the car operate. 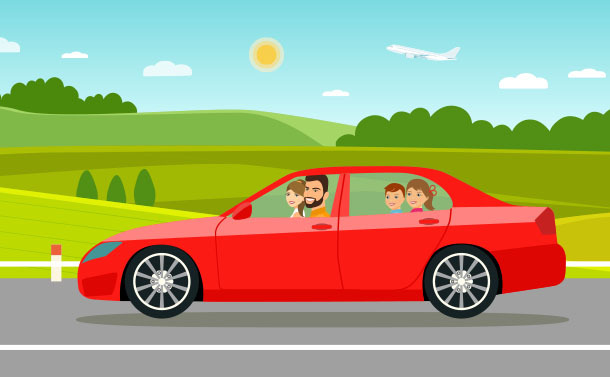 Priced at US $ 2.99, this application shall help a child relate to the entire journey and become instrumental in their quest to gain the maximum car knowledge. Hoopa City 2: The younger version of Sims the game, Hoopa City 2 is a unique game to offer curious minds. They can go on to create skyscrapers or pristine beaches. Furthermore, this application allows the kids to choose from 20 different cityscapes to choose from. Priced at US $ 3.99, this game is engaging and can easily keep kids busy on a long ride. Astro Cat’s Solar System: For those kids who find solace behind books and love to read and dream of far away spaces, this application takes them beyond the final horizon. With it, they learn about space and our solar system with the help of simple question and answers. As they move ahead into the different levels, they also learn how to build a rocket! Priced at US $ 3.99, this is a must have application for kids who are interested in this field of science. Seedling Comic Studio: For those kids that are creative and love to create art and hence enjoy reading comics, long car rides can be a bit tedious affair. This application shall help them to create their own customized comic book. What’s more, they can be the star of the same! With backgrounds, stickers, themes and dialogue boxes at their disposal, the end result is sure to be a colorful affair. This free application is perfect to showcase your child’s creativity. The final leg of a journey feels the most longest. It is so because the destination is so near. Hence, for those almost grown up kids, the pre-teens, we have games which are interactive and help them to establish their own individuality. 1 Second Everyday: Video Diary: Video Montage! There is nothing better that having a montage of the entire journey when it finally ends. For that purpose, this application allows young filmmakers to make 1 second videos which capture the essence of the entire journey. In the latest version of this application one can create 2 snippets of their day. They can broadcast the final edited clip on many different social media platforms. Priced at US $ 4.99, this application has a strong online community that uses #iSE as its tag. Stack The States: no matter how much one keeps busy, sitting in a car, for hours at end does get a little dire. That’s why, with this game application, one turns the table on long boring drives. For the 50 states in the USA, one can pick any and have access to all the trivia attached to the place. Also, one can use it as a puzzle game of placing together the different states together and completing the structure of the country. This application teaches one about the capitals of states and informs them about the famous, historic US landmarks. Priced at US $ 2.99, it is a must have app before leaving on a road trip. LeVar Burton Kids Skybrary 4: For US $ 4.99 per month, this application offers young readers hundreds of books which are both fiction and nonfiction. This application is inspired by LeVar Burton’s Reading Rainbow show and hope to continue the same lesson on this platform. Interactive animation makes reading a book more engaging and helps the child visualize. There you have it folks, the best road trip games apps that your kids shall definitely enjoy and make your road trip seem shorter than its intended time. Drop us a line on the comments section below to share your views on the applications mentioned in the list.